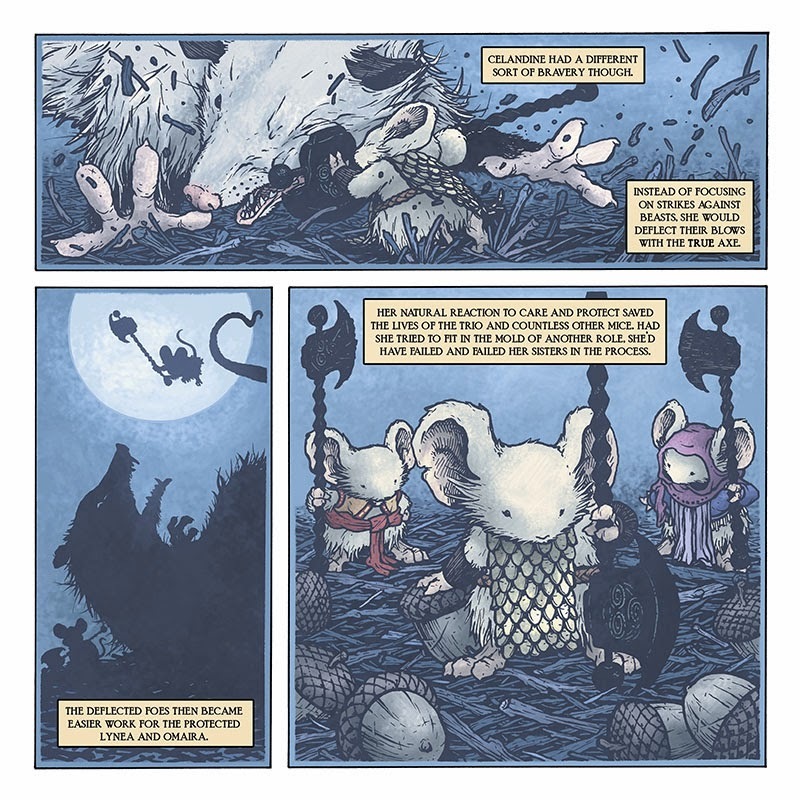 Table Titans is a webcomic by Scott Kurtz & Bryan Hurtt (colors by Steve Hammaker). 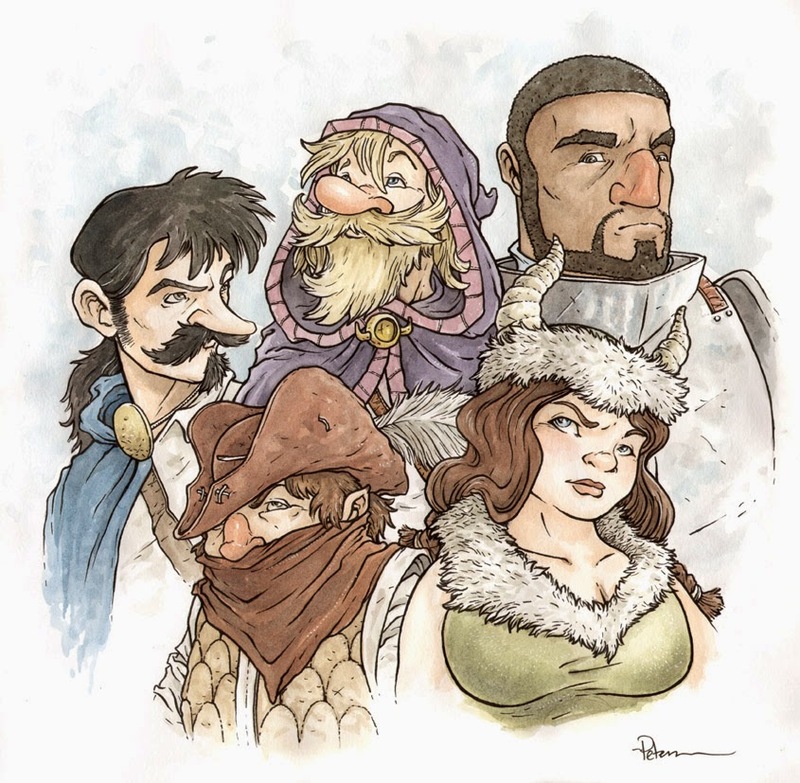 It's about a group of friends playing D&D, and while that may sound like a very narrow story, it's a really fun and accessable comic more about adventure and friendships and personality-types than anything game-specific. It also drives home a point I think is important with RPGs...that the rules are only there as structure so the players and GM can have fun telling a memorable story together. Because I enjoyed the strip so much, I did this piece of fanart for Scott. 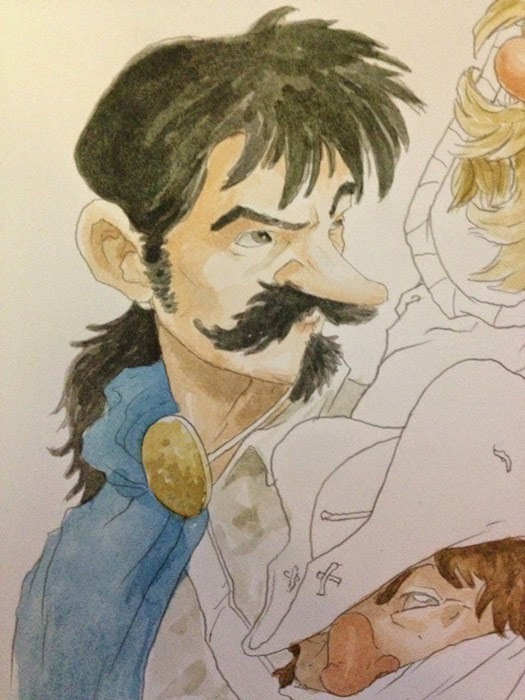 Today's blogpost I share the process of painting the piece. 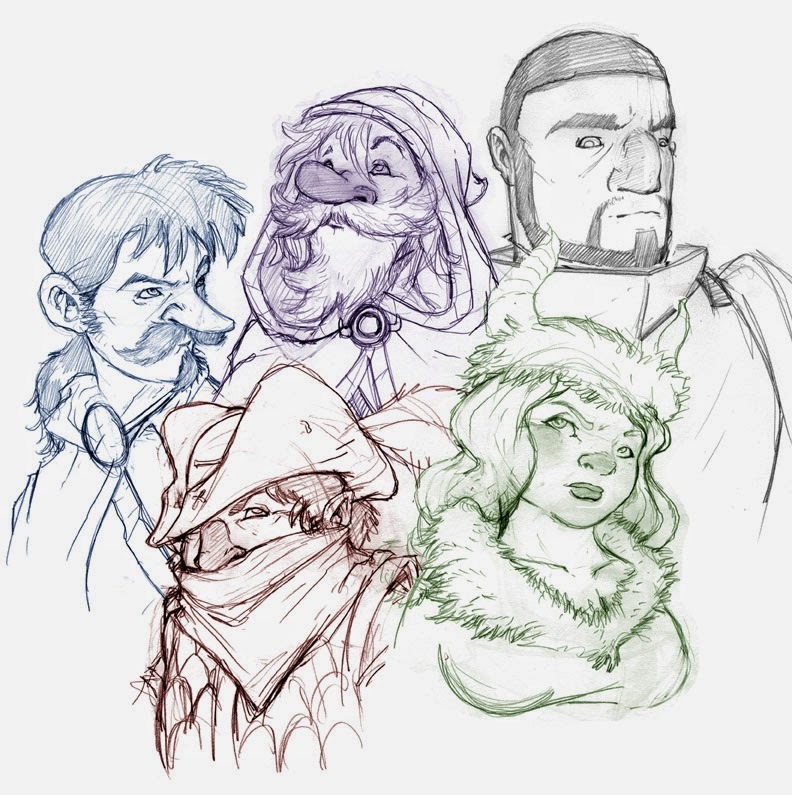 The first step was to sketch out all the characters and come up with a composition that looked good. I decided to have each character appear as their in-game persona because the costumes are more fun. 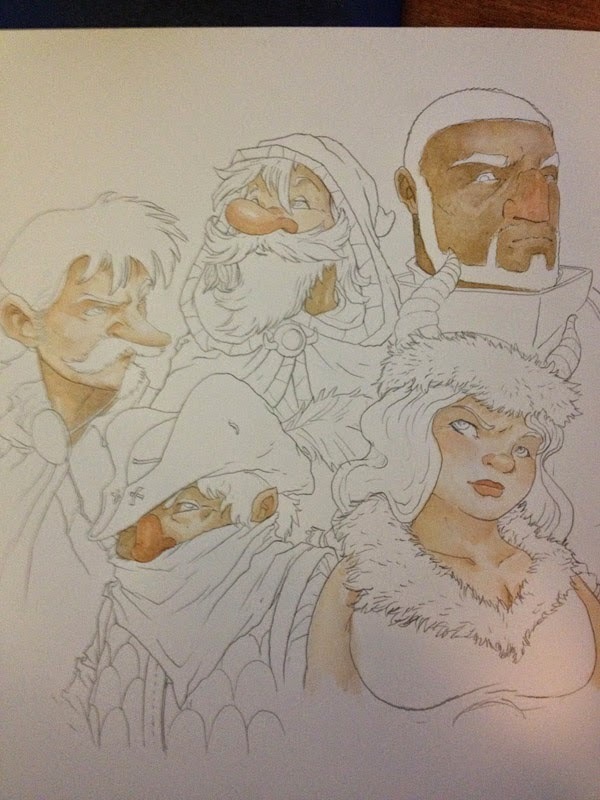 Each character was drawn separately in my sketchbook (each taking up a page). 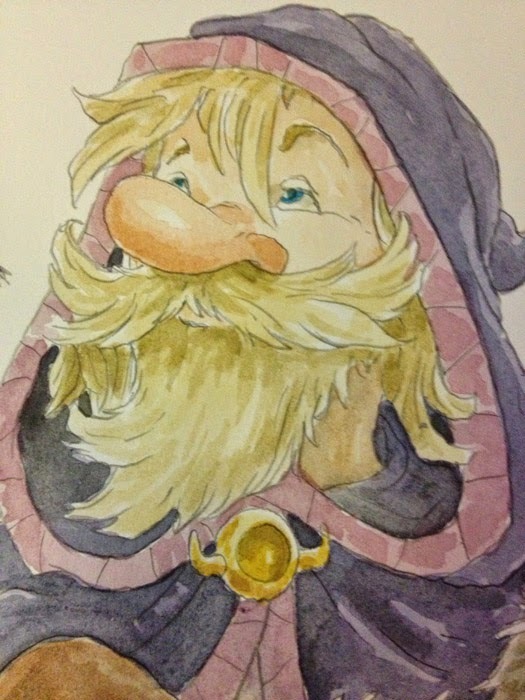 The scanned sketches were then tinted in photoshop and shuffled around until a usable layout appeared. At this stage I was also able to do some digital fixing of my drawings by mirroring the images and making sure the eyes were at the same height on the face, while also making subtle tweaks to get expressions the way I wanted. 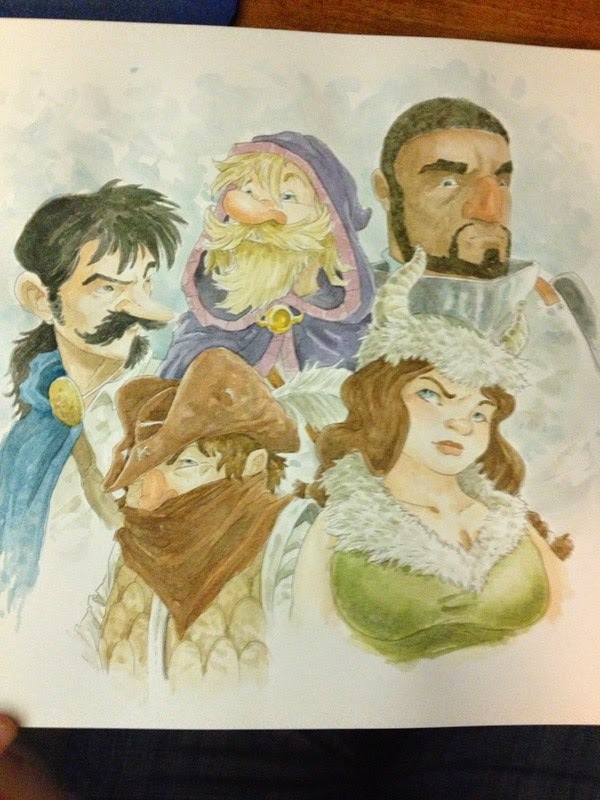 Here is the group after I had done all the watercolor work. 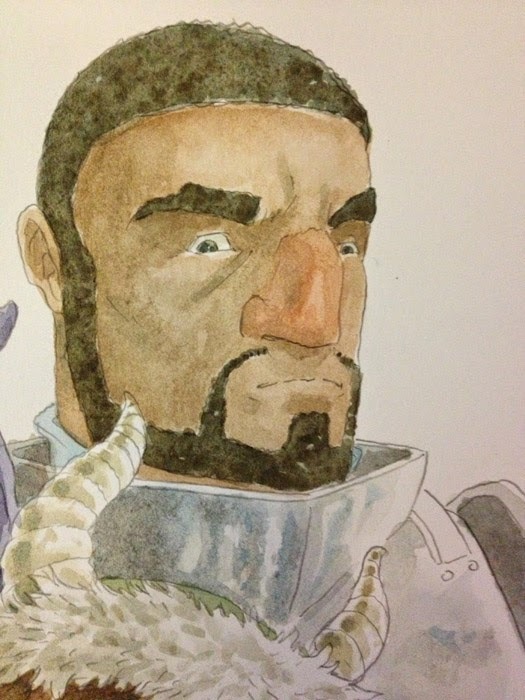 And as much as I like painting, and subtlety, I rarely feel like one of my watercolors looks 'finished' without line added. I am a line guy...and fighting it would be silly. So the next step was to go back over the pencils an ink in the line work adding some minor details and textures. So here again is the finished piece with inkwork. If you enjoyed it and/or like Roleplaying, consider reading Table Titans from the beginning, it's really fun and well made. 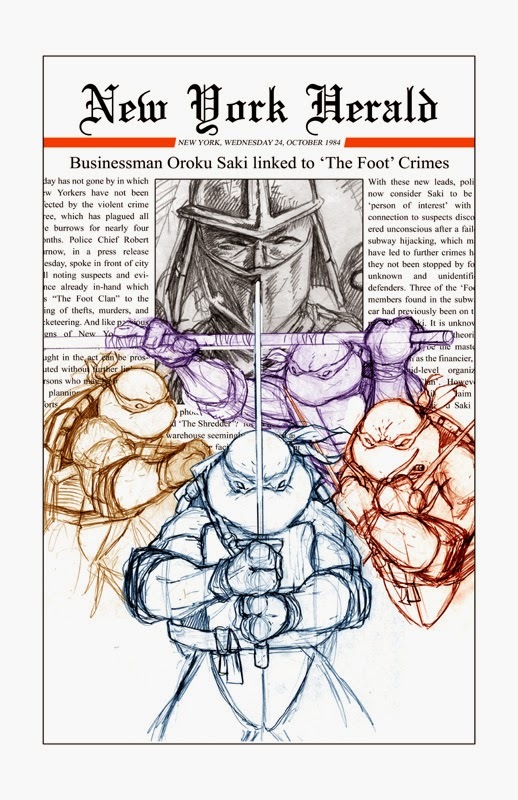 For the 30th Anniversary of the Teenage Mutant Ninja Turtles, IDW is doing a special 48 page book featuring new stories by past TMNT artists including a new cover by Eastman & Laird! 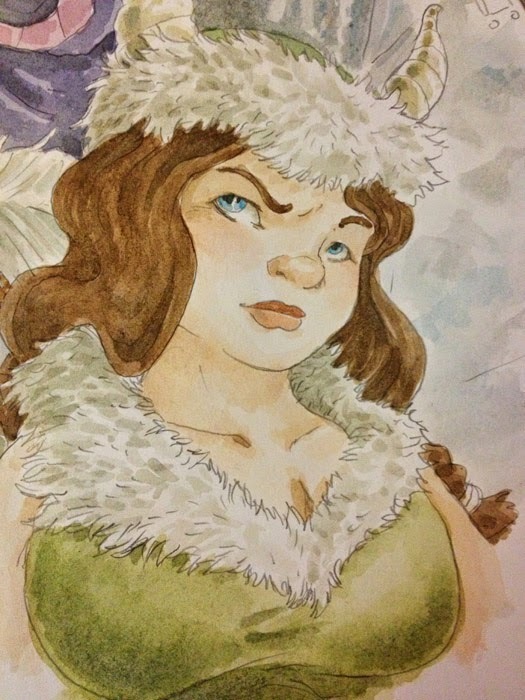 I was asked by editor Bobby Curnow to do a pinup for the book. 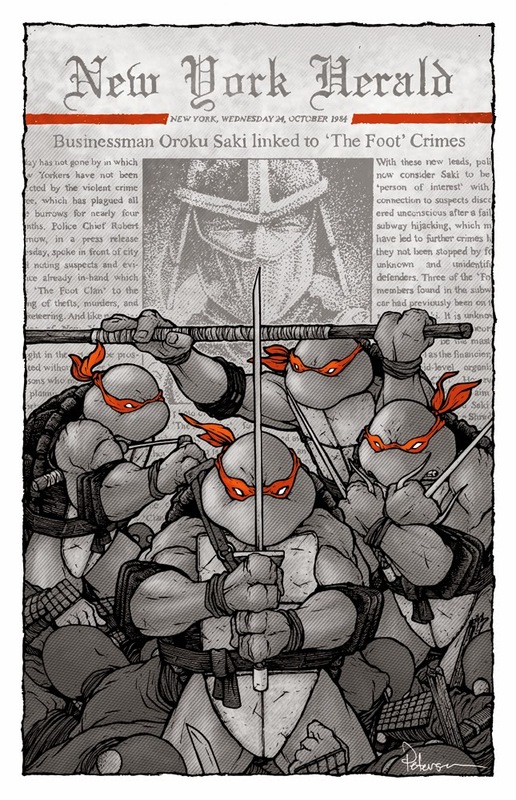 I've mentioned before what a special and influential part TMNT played in me understanding storytelling, comics, and wanting to be a creator (it also was the link that started my friendship with the real life-Kenzie to my Saxon: Jesse Glenn). To the left you can see the finished piece, but below are the steps of creating it along with some though process as I worked. The newspaper concept wasn't my first idea. I originally was going to do something with the four turtles each lugging along all their earthly possessions (in an abandoned shopping cart, milk crates, patched duffles, etc,) down a sewer tunnel as just around the corner NYC sewer workers were doing work in that branch of their home. It proved to be something I saw more as a story and had a hard time summing it up in a single image. 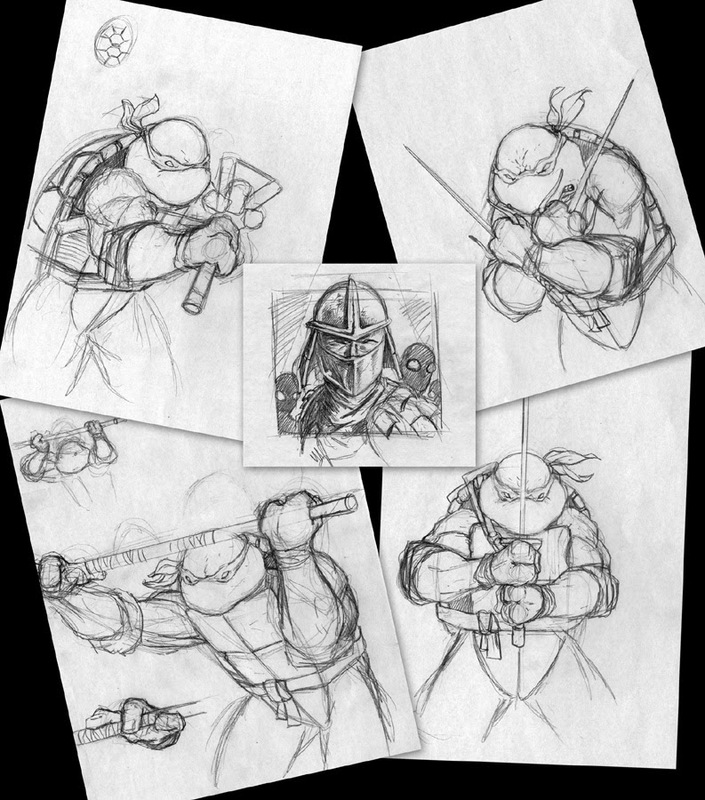 Instead I focused on just drawing each of the turtles in a cool pose where I might be able to group them together well. As I did that the concept of a newspaper came to me and I drew a 'photo' of Shredder too. Each of these are on separate sheets of copy paper, which give me mental freedom to make a mistake and pitch something that's not working because it's not on 'good' paper or bound in a sketchbook. I printed the composited layout you see above onto copy paper (it was larger than one sheet so I had to patch it back together with tape) and then taped it to the back of a sheet of Strathmore 300 series Bristol. I had toyed with not inking any of the newspaper elements of then the Shredder 'picture' and just use my digital type and layout to save me time inking, but I tend to find that when you try and blend type and art together that isn't dialogue or a sound effect, it always sticks out like a sore thumb. So tracing over the printout I was able to hand letter the masthead and all the article, giving it a bit of imperfection as I went to replicate printing errors on newsprint. 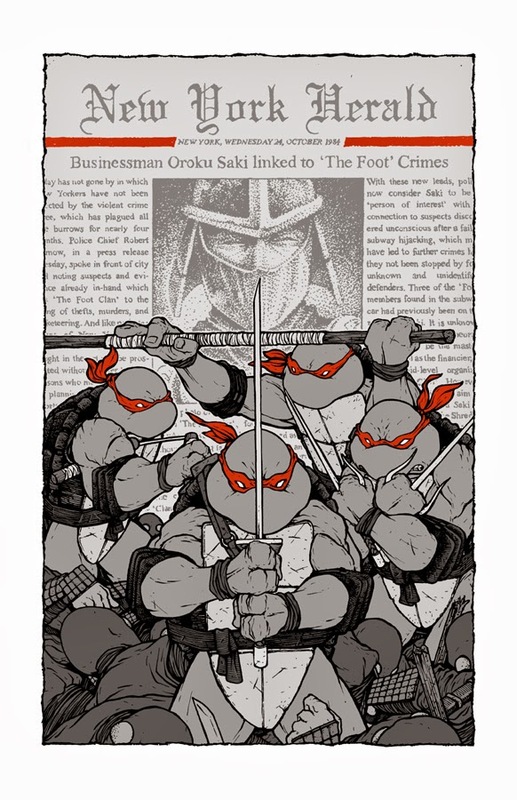 You will also notice I added heap of dead/unconscious foot soldiers around the TMNT. 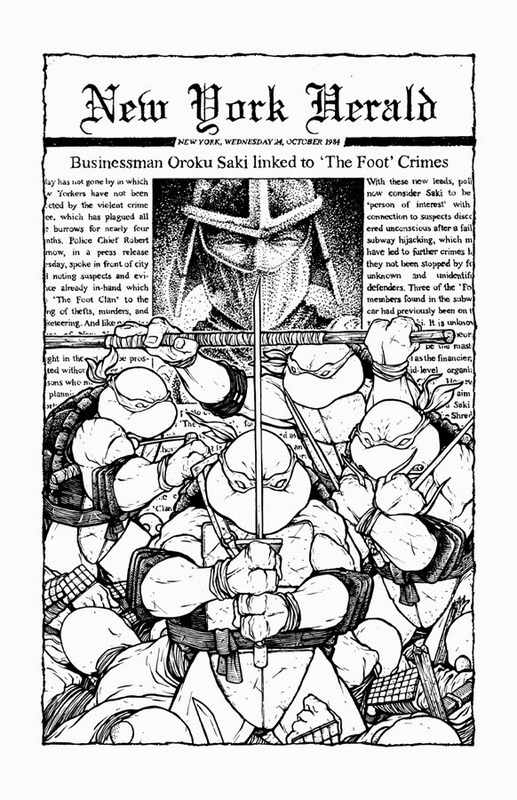 My original plan was to fade the turtles out to white, but opted to give them a more solid base and help sell the story about the Foot Clan crime wave. 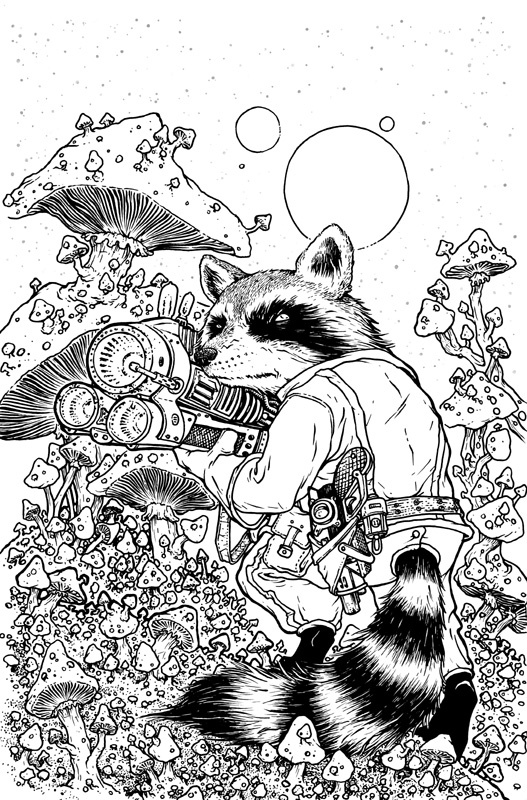 I was pleasantly surprised in the spring of 2013 to receive an email from Steve Wacker at Marvel seeing if I was interested in doing a Rocket Raccoon cover (this was before I did my Animal Avengers cover). I was given a lot of creative freedom and leeway for the composition. Steve said that it should be a cool shot of Rocket with his guns. I offered up that he could be on an alien planet and I went from there. This is a digital composite of three or four drawings in my sketchbook. 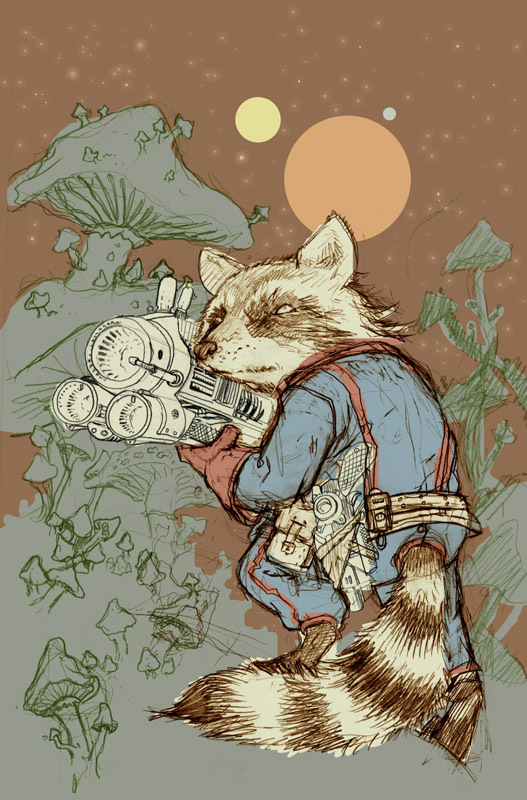 I drew Rocket separately from the landscape (towering mushroom-trees). And I drew the guns on a different sheet of paper as well. Working with a piece in sections allows me to quickly scrap something if I don't like it without having to erase around the parts of the drawing I like. Once the sketches were all scanned and pasted together, I threw in a little color to get an idea of the final colors and mood. However, when I was coloring the cover, I found that I was doing a lot of pushing and pulling to get Rocket and the ground he was on to come forward. When the background was lighter, the sky had to be light too, and that meant the foreground and Rocket were dark (just by the relative tones, not by me adjusting them). I opted to darken and lower the contrast on the further landscape and make sure Rocket was the lighter focus. 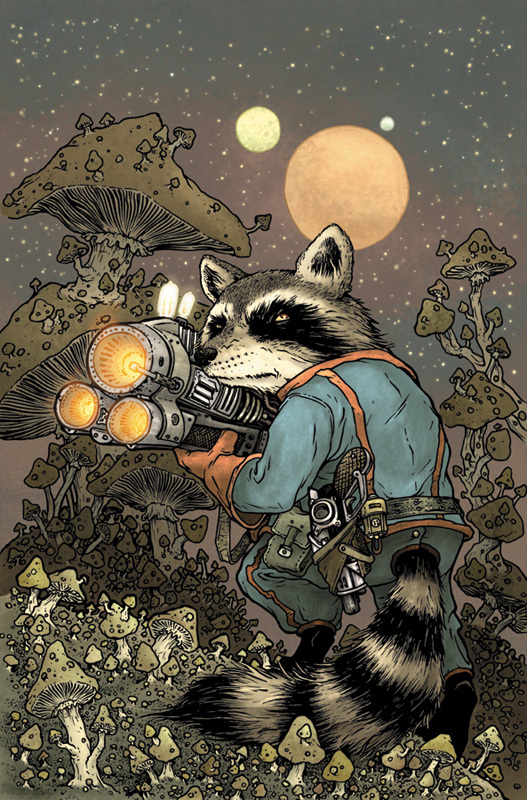 This cover will appear as a variant on the recently announced ROCKET RACCOON #1 written & drawn by Skottie Young! On-Sale This July! As I said at the top of the post, this story is a tale told to Rand. He hasn't been a major player in Fall or Winter, but he will be in the upcoming (and as-of-yet unscheduled) Weasel War of 1149. So, this story gave me the opportunity to introduce readers to him a bit more. 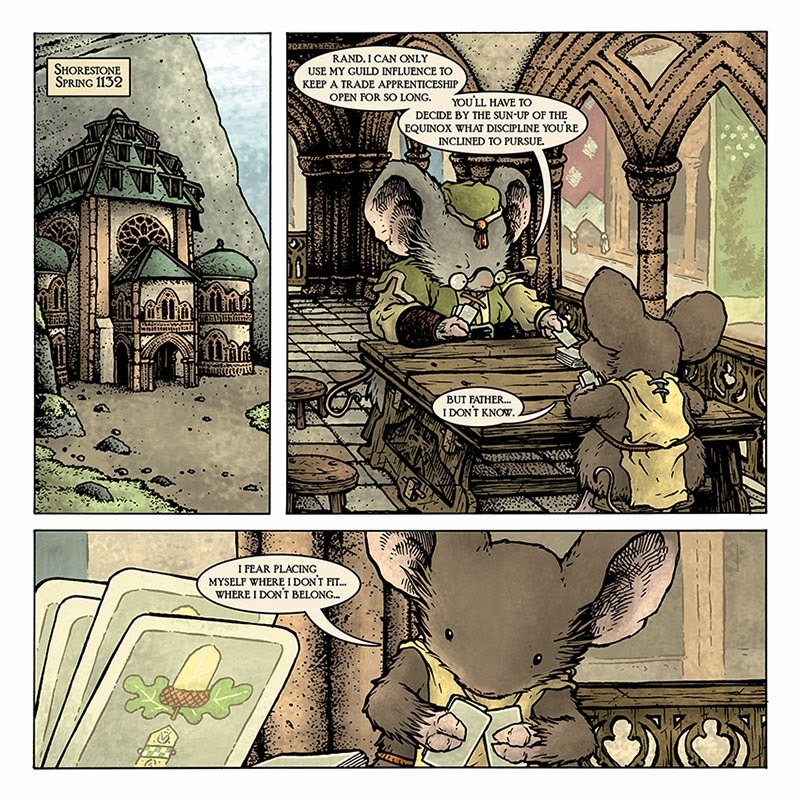 At the start of the story we see that as a child he and his father (and mother too) lived in Shorestone, a city I featured in Black Axe and is a building trade craftmouse den as well as having secret ties to the mythic Black Axe itself. 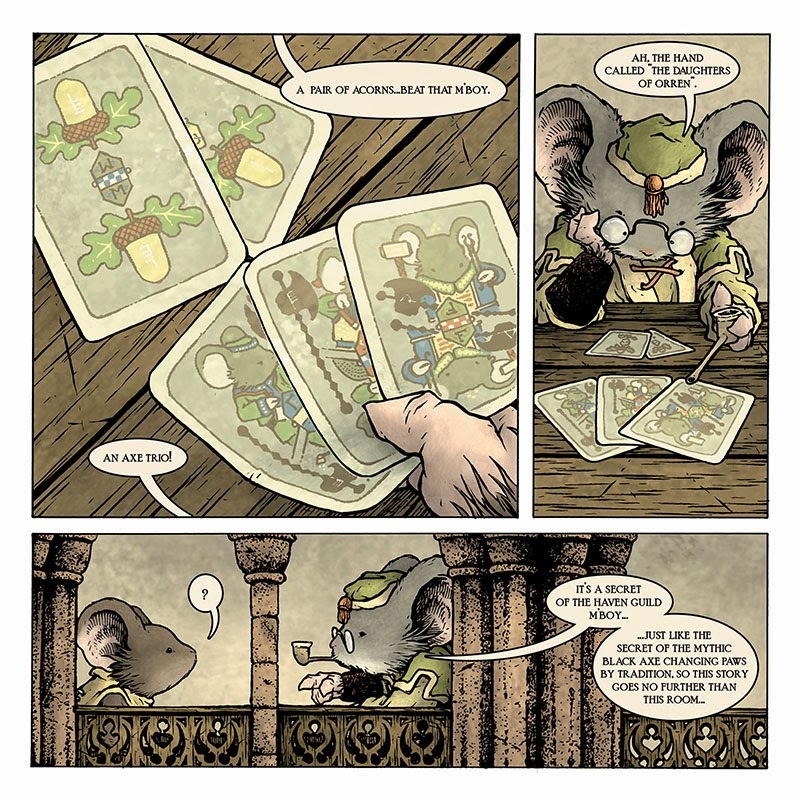 In past years, I used a few objects as lead-ins for the stories: stained glass, marionettes, and storybook style illustrations. This time I chose cards. In my blogpost about the cover, I described the visual influence for these cards. 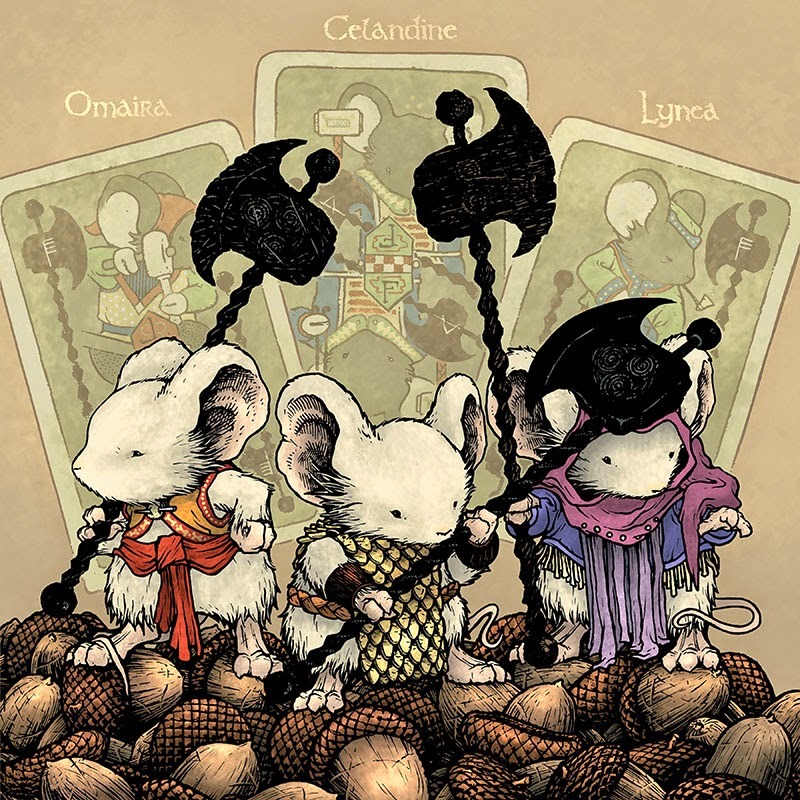 I've got all my notes for how a complete set of them work (with their own versions and counts of suits and numbers) The cards we see for the story are 3 axes (each with a different Haven Guild founder 'suit' and a pair of acorns. 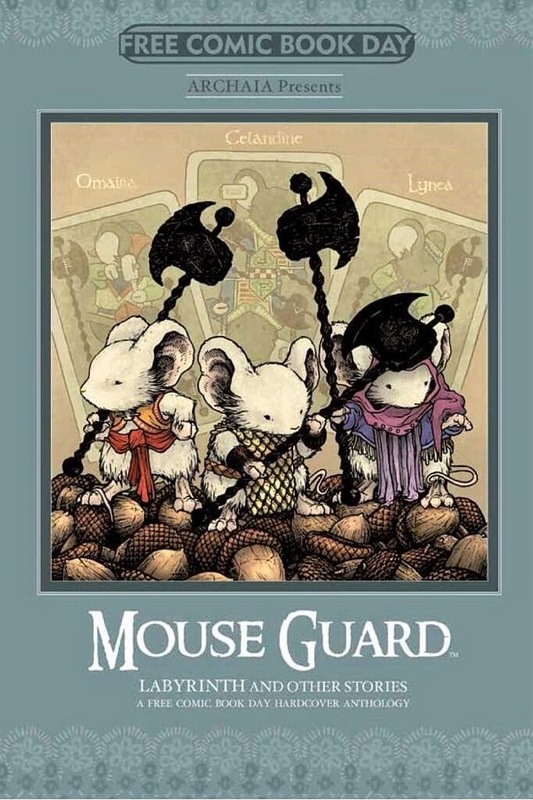 The acorns were chosen as the other symbol because I'd already drawn the cover with the characters standing on a pile of acorns and didn't have a way to visually explain it beyond that it looked cool. 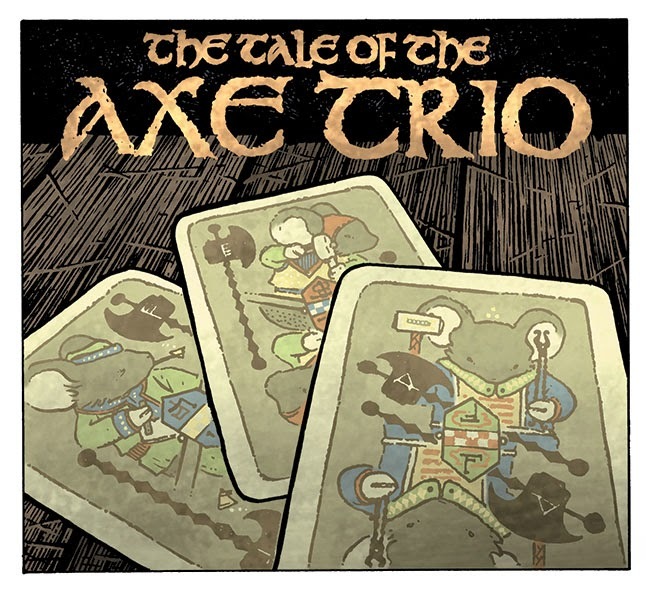 As the tale within a tale begins, the readers are introduced to some Black Axe lore. 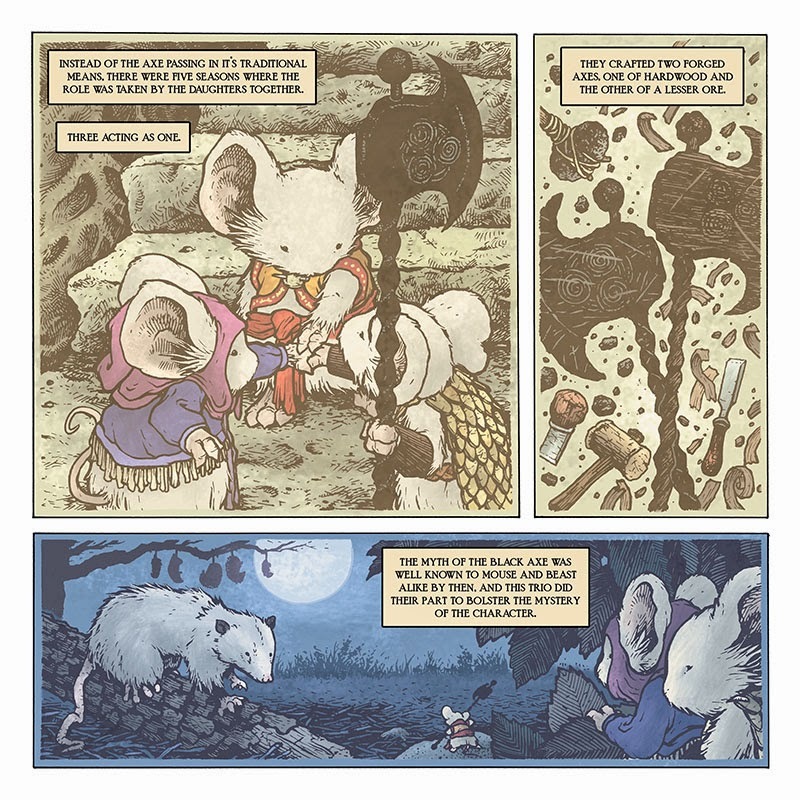 Orren as the 4th wielder of the Axe was covered (in pictogram) in The Black Axe book, but the story of his death and children are new for this story. 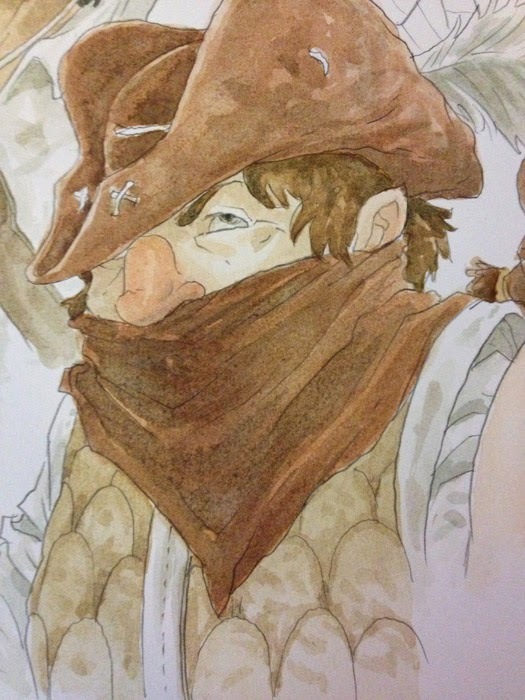 The location of Nettledown, is from Nate Pride's Legends of the Guard story "The Ballad of Nettledown". 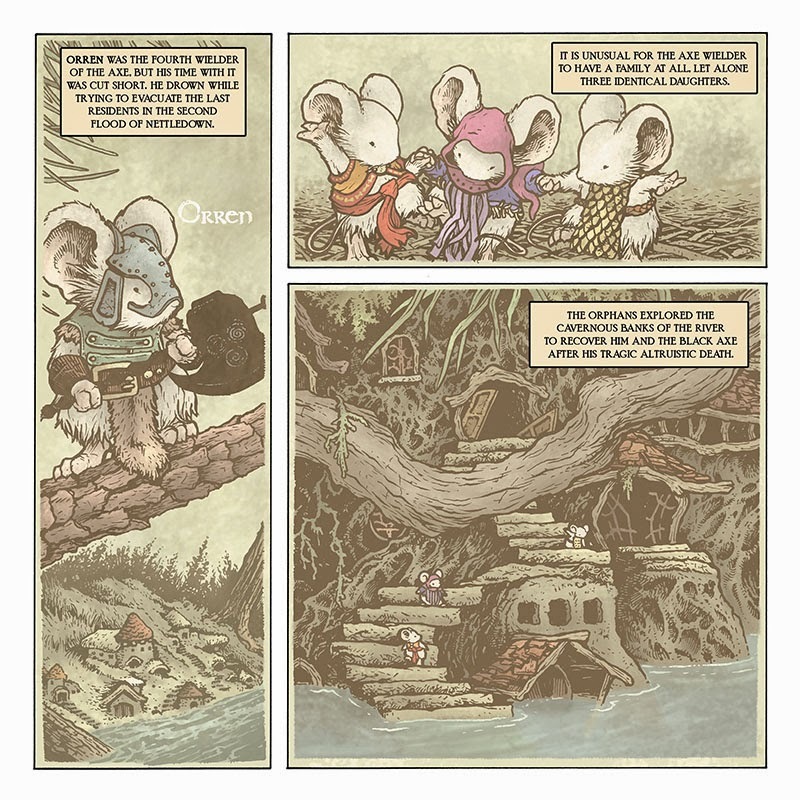 I studied Nate's pages to try and be consistent with the visual depiction of the location. And while it's never appeared on a map, I have a suspicion if I ever draw a much older map of the territories, you may find it listed there. 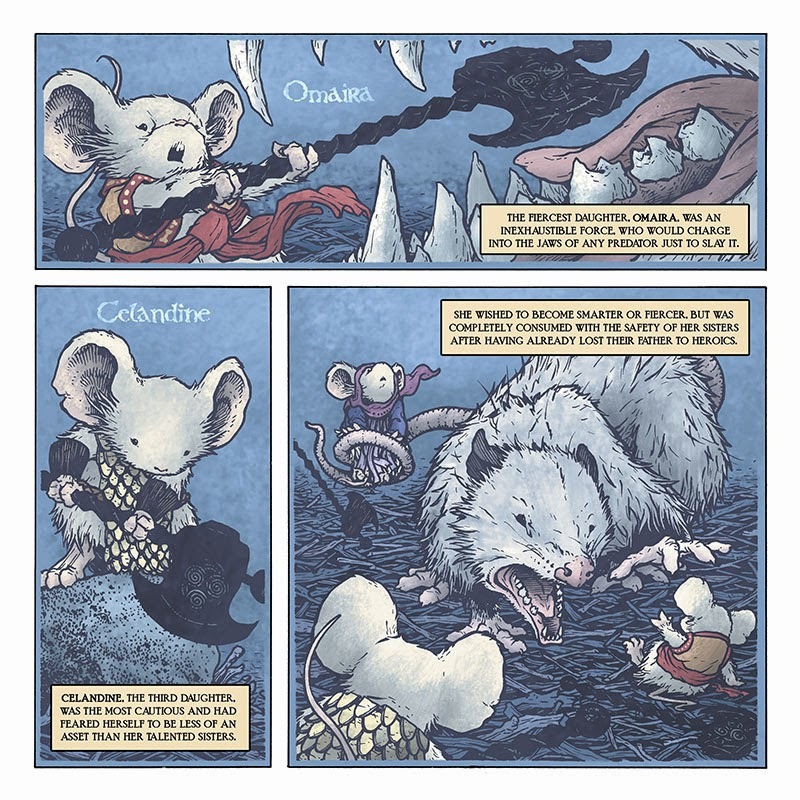 The idea of having three young sibling mice take over the role of the Black Axe was something I'd come up with back when writing the end of Fall 1152. 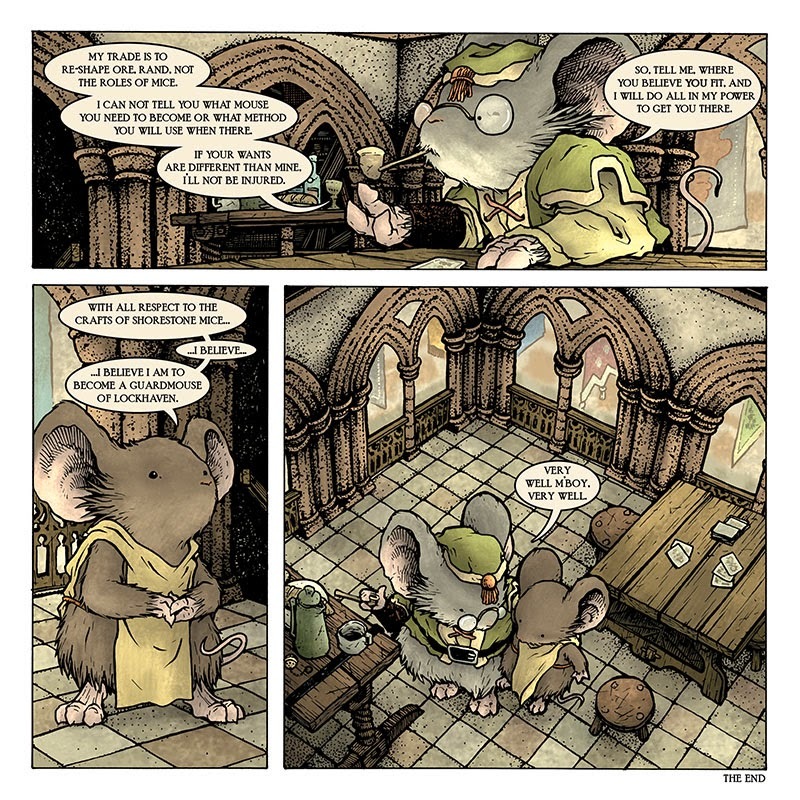 I shared the idea with Mark Smylie over breakfast at the Baltimore convention that year, and we both agreed that while fun, seemed too much like a light hearted children's tale compared to the tone at end of the Fall book. So I stuck it away in my back pocket until the time was right. The three sisters are obviously analogs for Kenzie, Saxon, and Rand. Beyond personalities I added a few visual cues: Omaira's tied sash-belt echoes the tied knot of Saxon's cloak, Lynea's hood is ment to remind you of Kenzie's hood in Winter and the long ribbons in front are to symbolize Kenzie's longer slender frame as well as the verticality of his staff, and Celandine's scale armor is symbolic of Rand's shied both in function and shape. 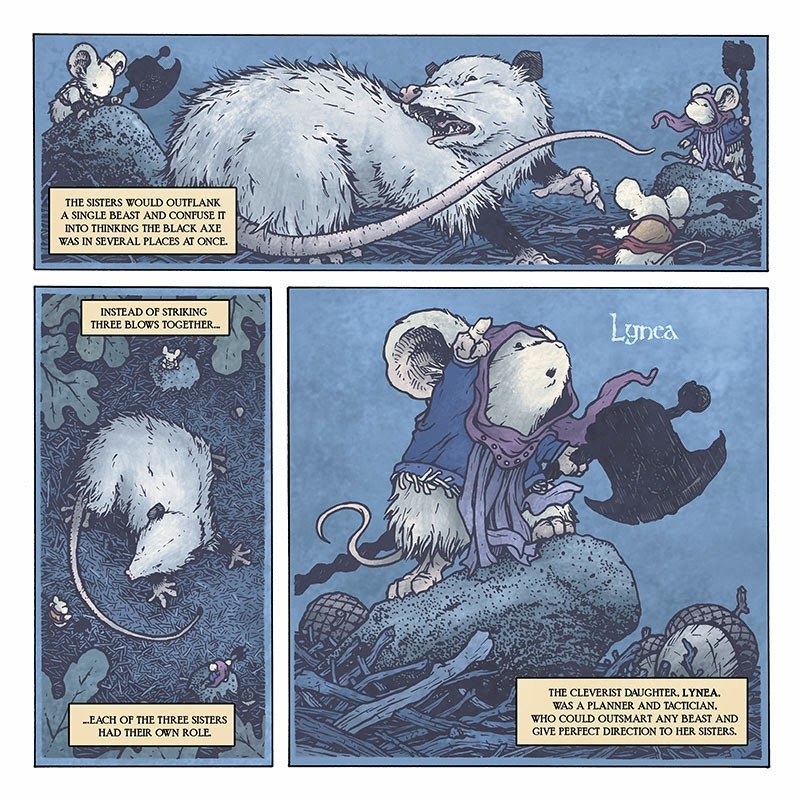 Part of my goal was to pre-explain how Rand, as a mouse who mainly ever carries a shield, functioned with a Saxon and a Kenzie.